Powder coated scratch resistant blue finish. Supplied fully assembled with footplates. Load capacity of 3600kg UDL. Versatile enough to change with the demands of your business. Levels can be height adjusted every 25mm. Beams are slotted into frames and fixed with safety clips. Level heights can be adjusted every 25mm. Add-on bays allow for Rapid Span to grow with your business. Ideal for harsh working environments. Extra heavy duty galvanized steel panels. Each level can take up to 1100kg UDL. UDL weight varies on the shelf width. Scratch resistant orange powder coated heavy duty levels. Levels can be adjusted every 25mm. Each level can take up to 1000kg. High level capacity allows for heavier loads. Beams slot easily into frames and are secured with safety clips. Add-on bays allow for a money saving solution when long runs are required. 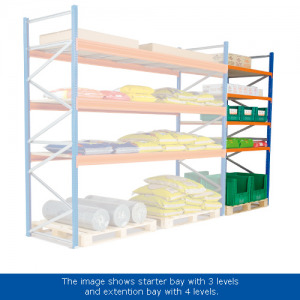 No bottom beam required – allowing palletised storage at ground level only. 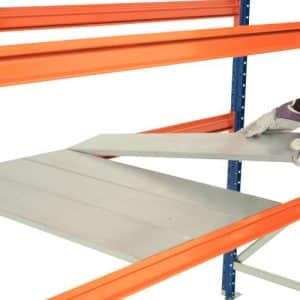 If you require a storage system for large and bulking items our Wide Span Racking systems may be the solution you require. 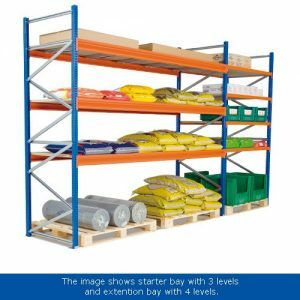 These Heavy Duty Racking systems offer unpalletised storage on all levels and offer’s pallet storage on the ground level. 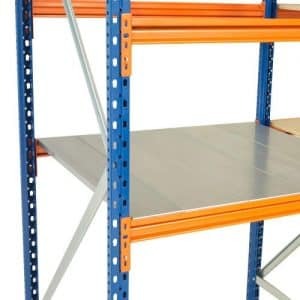 If you have a storage requirement which is a mix between palletised and loose items this racking unit is the answer. 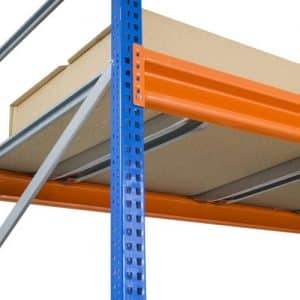 Our Wide Span Racking Systems comes with a variety of shelving material including standard & heavy duty chipboard levels along with a Galvanised Panel option. These 3 different levels have separate UDL limits so it’s important to check the weight limitations which goes up to 1100kg.